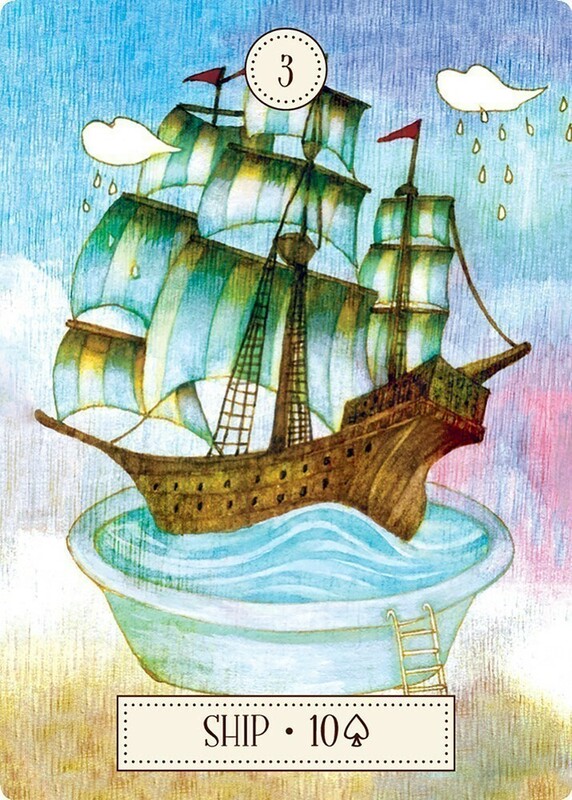 This charming 36-card Petit Lenormand deck offers fresh, new perspectives for this traditional system of fortune telling. Contemporary Korean artist Kwon Shina’s imaginative style of artwork provides the reader with clever visual cues that capture the mood, nuances, and inner meanings of the cards. 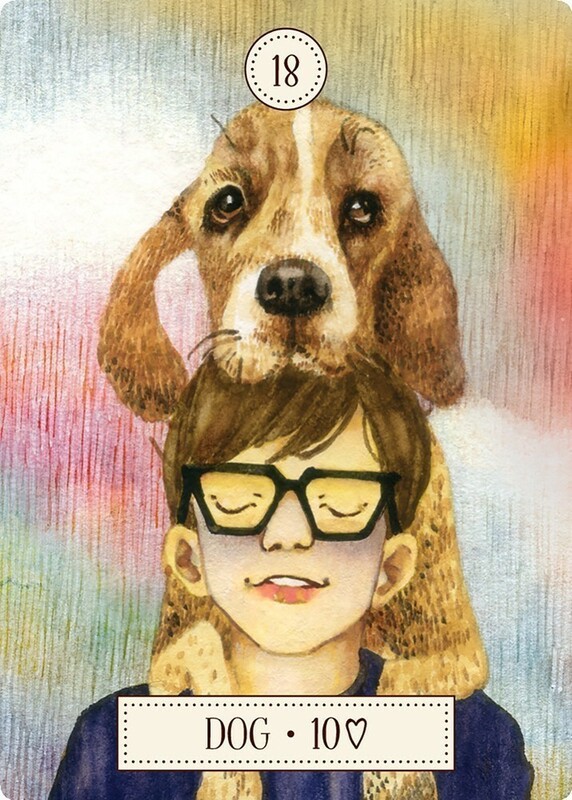 When you look at the Dog card, you will know in an instant this card portrays loyal friendship, not a threat. If you are learning Lenormand for the first time, this is a delightful deck to learn the core meanings. If you are already familiar with the Lenormand system, Kwon’s dreamy images will inspire you to look at Lenormand in a whole new way. The 92-page booklet offers keywords, quotations and interpretations that help the reader understand the lively narrative interplay between the 36 cards. 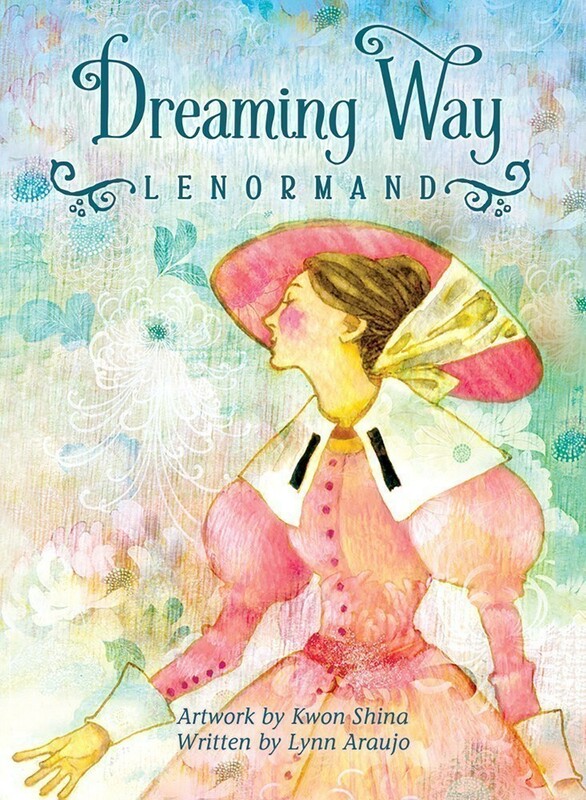 Dreaming Way Lenormand will allow you to do insightful readings that bring clarity to any situation, whether you are working with pairs of cards, the Grand Tableau or one of the starter spreads suggested in the instructions. I was so excited when I received this deck today!! I had only been able to see three of the cards through the Internet and was anxious to see if all the cards would be as lovely. The answer is yes!! The cards are simple and gorgeous!! The art is a little funky but that is one of this decks charms. The entire package is first rate. The box is sturdy, yet beautifully done. The LWB (little white book/guide book) is so cute. I can't believe they took the time and made such a finely made LWB. The cards are more than I could have asked for. 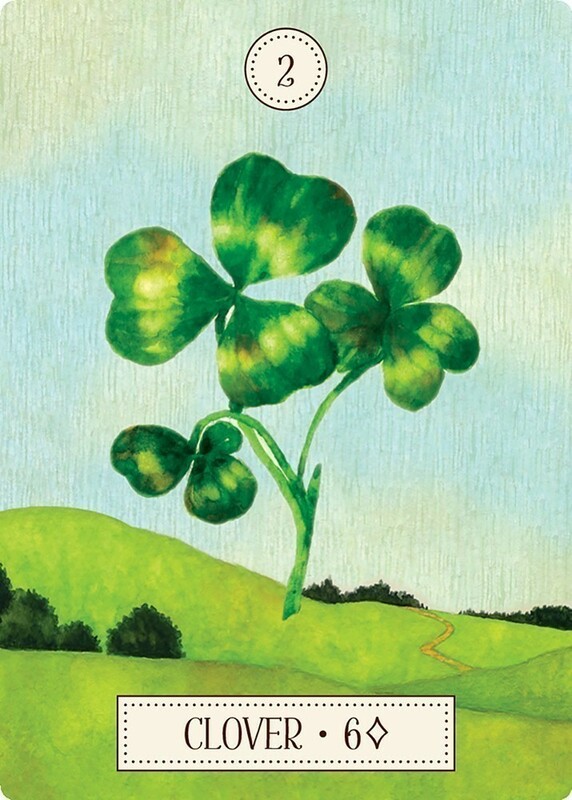 Big simple images (which is important in Lenormand readings) that are whimsical, artful, and fun. I have seen lots and lots of Lenormand deck. I have quite a few. But this deck is my favorite BY FAR!!! Can't wait to try them out!!! I'm a professional graphic designer/art director who studied art and design in college. I know what I like. I also happen to be married to a tarot luminary who is a deck collector, so I do have a fair bit of exposure to the world of divinatory decks. 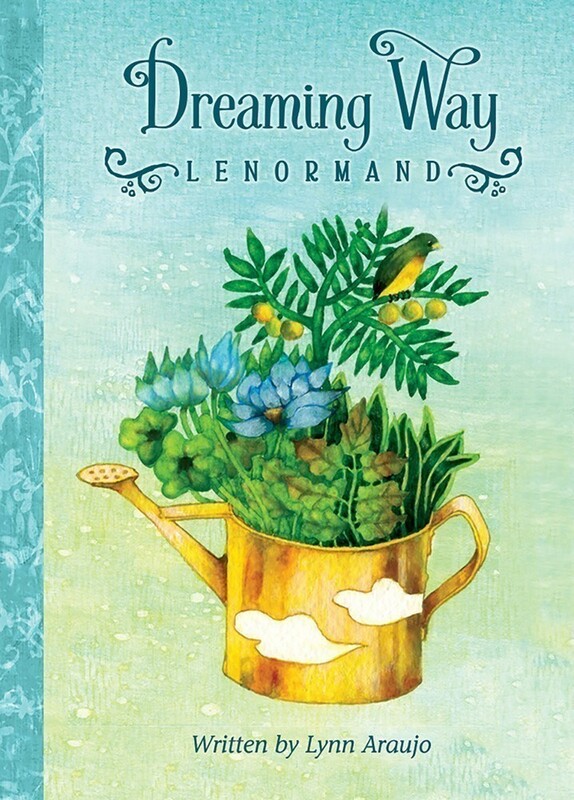 The Dreaming Way Lenormand is a GORGEOUS package! The production values are off the charts. I find the card stock and solid packaging to be first rate. Definitely collectible. The sturdy box is thoughtfully designed and nicely printed. The booklet has a thick, full-color card-stock cover, and the printing is top-notch. Kudos to the designer. And yes, Lynn Araujo's introduction and the card descriptions are superb. The writing is smooth and lyrical and perfectly compliments artist Kwon Shina's work. This will be a deck I will use while learning the Lenormand system. The reflective quotes for each card are well thought-out. For example, the Garden (20) card has a Charles de Lint quote that states, "I do believe in an everyday sort of magic --- the inexplicable connectedness we sometimes experience with places, people, works or art and the like." All-in-all, the design of both the cards and the LWB are done with a very professional and informed touch. The cards themselves feel wonderful in my hands. They're printed on thick stock and have impactful imagery. I really dig the recurring cloud motif. The Duchampe-esque card-back is nothing short of magical! 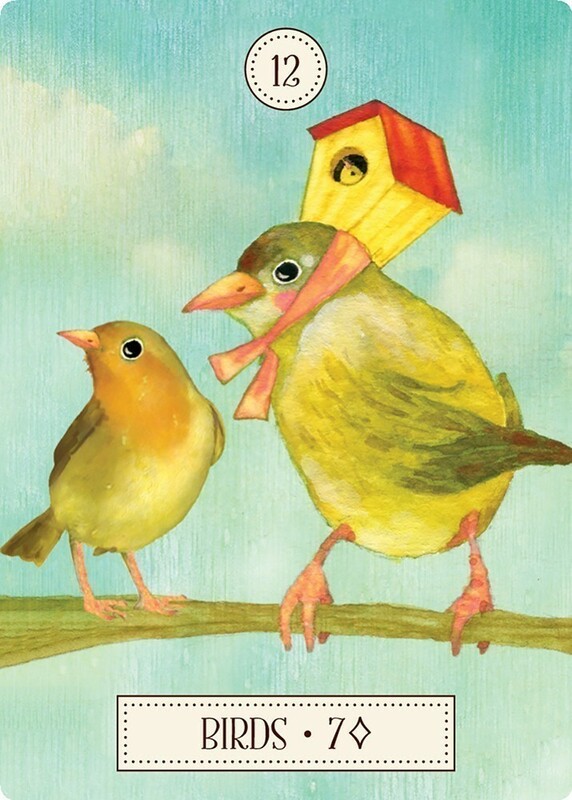 The card imagery ranges from very straightforward (clover, house, tree) to more complex art that tells a story the longer you look at it (birds, bear, mice, fish). The Dog card truly captures a sense of loyalty with its unique presentation. Some standouts for me are Clouds, Coffin and Bird. There is a lot to explore here, lending to more expansive readings as the user becomes more familiar with the cards. This is a must-have for Lenormand fans and anyone who loves art that evokes a sense of wonder and playful surrealism without deviating from core meanings as described in the book. 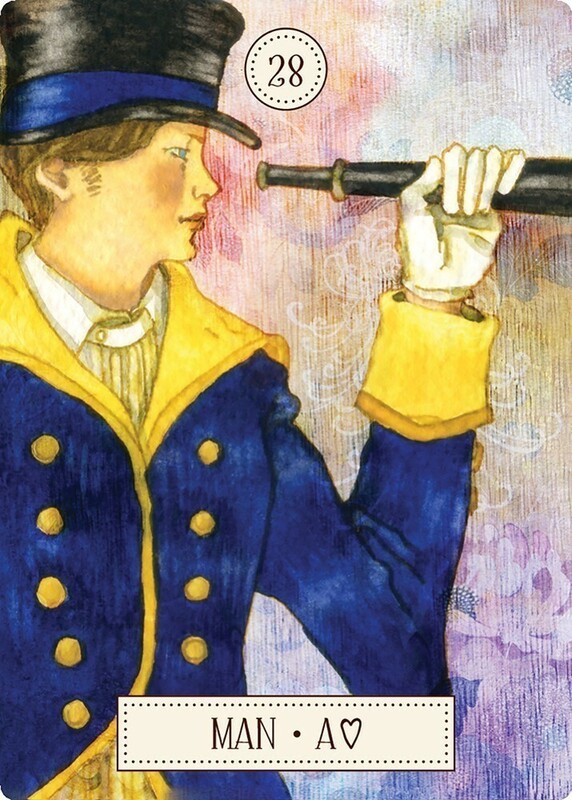 As a beginner, both art and writing provide the perfect platform for easy reading with a captivating twist. 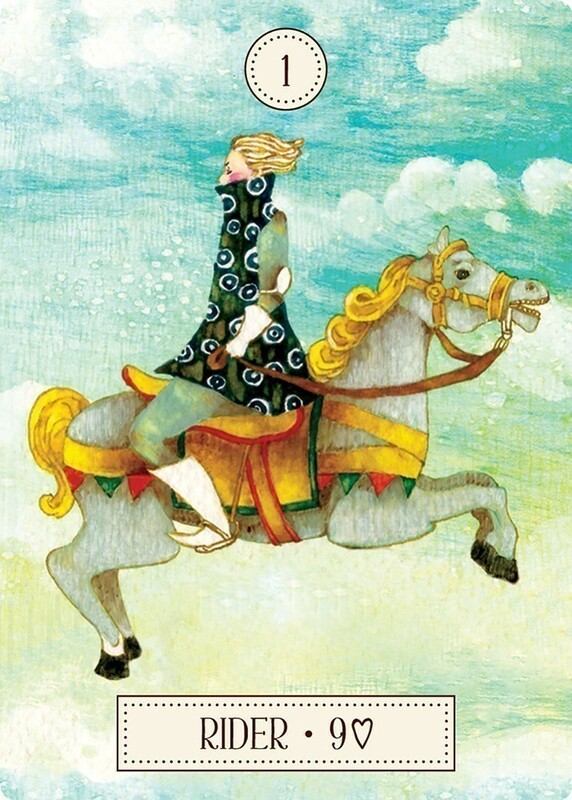 Who can resist the blend of Lenormand cards, Kwon Shina’s art (which I knew and loved from the Dreaming Way Tarot published by U.S. Games), and commentary by the accomplished Lynn Araujo? Yes, I was “predisposed” to like (love) this deck – but I think maybe you are, too! Anyway, for those of you convinced that there were a limited number of ways the Lenormand cards could be presented and they’d all been done, Kwon Shina didn’t get the memo. Her Bear (card 15) is a person covering his or her face with a bear mask; her Fish (on card 34) seem to be flying rather than swimming, protected from the elements by a large umbrella; her Book (card 26) has an open door carved out of one side. 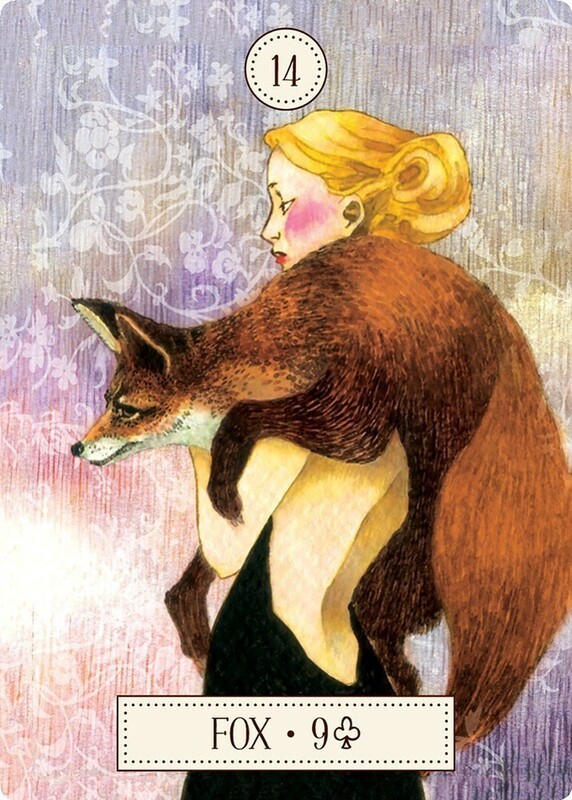 The Fox (card 14) is draped over the shoulder of a woman as if it is her pet or part of her apparel. Exploring each card is a delight and a challenge. Araujo’s Little White Book is written in a clear, concise style that imparts a lot of information without droning on and on. The Introduction brings us into the process and elements involved in the creation of the deck. I really like the idea of using quotations from famous people to represent each card and the quotations that were chosen. 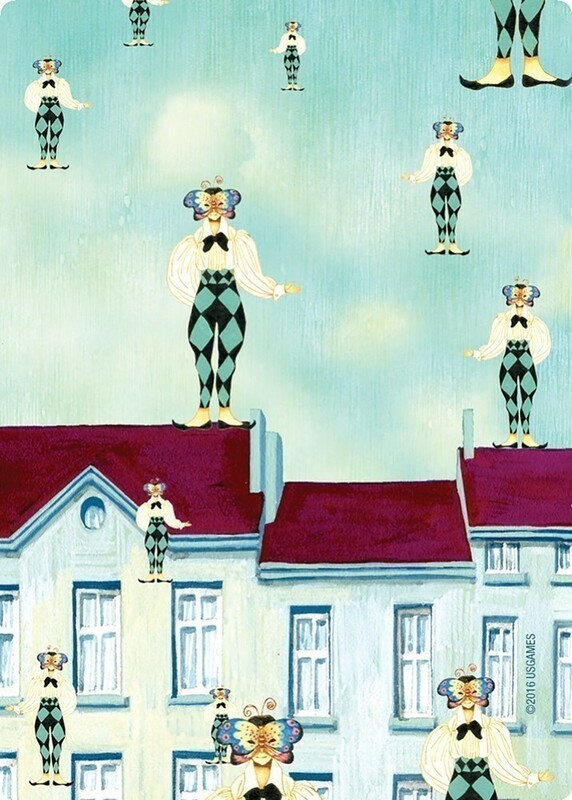 Card backs feature a row of houses and a whimsical, jester-type figure in a butterfly mask. The figure is repeated randomly in various sizes and places – in the sky, on the roof, etc. I get the impression that the figures are rising continuously from the ground into the air, pausing occasionally to pose on a rooftop. I suppose they could also be floating downward to land on the ground. Or both at the same time! The Little White Book includes an information Introduction by author Lynn Araujo, who also provides a two-page spread on each card featuring the card number, title, and playing card association; a quotation; a description/discussion of the card meaning; and a set of keywords. Araujo’s clear, direct writing style is perfect for seasoned Lenormand readers as well as beginners. A section in the back of the booklet titled “Reading with Dreaming Way Lenormand” offers examples of a 2-card spread, a line of five cards, and the Spiral Spread, which can be done with any number of cards (ten cards or more seems ideal). This very sweet deck is the original artwork of Kwan Shina whom you may know of from the Dreaming Way Tarot Deck. The accompanying booklet is written by Lynn Araujo. This deck differs from so many others, like Maybe Lenormand, in that it is original artwork – no photoshopping a deck here and I so appreciate that. The colors are light and bright for the most part, no cards in this deck have a dark feel which many will appreciate. You will also get a vibe that this deck is whimsical, it has an almost fairytale feel to it. This again will be appreciated by those who don’t like the more “traditional” looking decks and want something more suited for their tastes of a more “current” style of Lenormand deck. The cards all have the playing card noted in the lower bottom of the cards after the cards name, the traditional Lenormand number of the cards is top center. The way this information was included (and I strongly feel playing card info is needed on all Lenormand decks) was included does not detract from the look of the artwork which can happen. I spent sometime working with this and first thing to note is these are poker size cards 2.5 X3.5 inches. The quality of the card stock is good and the deck does shuffle well – something important – at least to me. They come in a very sturdy box that will protect them well and I actually used the box lid upside down as a book holder for the LWB as I was getting acquainted the cards. All in all the imagination and almost dreamlike sometimes ethereal look to the cards is sure to be a hit and I hope enjoyed for many years to come. The deck should be currently available at local merchants by you and if not ask them to order it for you!